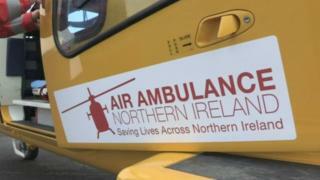 Northern Ireland's new air ambulance was in service at last week's North West 200 and organisers say the the development is a tribute to the late Dr John Hinds. Dr Hinds, a prominent campaigner for the service, died at last year's Skerries 100 motorcycling event in north county Dublin. Motorcycle stars Eugene Laverty and Jeremy McWilliams lauded the Air Ambulance Service which was the official charity of last week's event on Northern Ireland's north coast.